Zulu is a 1964 British epic war film depicting the Battle of Rorke’s Drift between the British Army and the Zulus in January 1879, during the Anglo-Zulu War. It depicts 150 British soldiers, many of whom were sick and wounded patients in a field hospital, who successfully held off a force of 4,000 Zulu warriors. The film is notable for showing the Zulu army as disciplined and governed by strategy. The film was directed by American screenwriter Cy Endfield and produced by Stanley Baker and Endfield, with Joseph E. Levine as executive producer. The screenplay is by John Prebble and Endfield, based on an article by Prebble, a historical writer. The film stars Stanley Baker and introduces Michael Caine, in his first major role, with a supporting cast that includes Jack Hawkins, Ulla Jacobsson, James Booth, Nigel Green, Paul Daneman, Glynn Edwards, Ivor Emmanuel and Patrick Magee. Future South African political leader Mangosuthu Buthelezi played Zulu King Cetshwayo kaMpande, his great grandfather. The opening and closing narration is spoken by Richard Burton. In 1879, a communiqué from Lord Chelmsford to the Secretary of State for War in London (voice-over narration by Richard Burton) details the crushing defeat of a British force at the hands of the Zulus at the Battle of Isandlwana. In the aftermath of the battle, the victorious Zulus walk amongst the scattered bodies of dead British soldiers and gather their rifles. At a mass Zulu marriage ceremony witnessed by missionary Otto Witt (Jack Hawkins) and his daughter (Ulla Jacobsson), Zulu King Cetewayo (Chief Mangosuthu Buthelezi) is also informed of the great victory. A company of the British Army’s 24th Regiment of Foot is using the missionary station of Rorke’s Drift in Natal as a supply depot and hospital for their invasion force across the border in Zululand. Receiving news of Isandhlwana from the Natal Native Contingent Commander Adendorff, who warns that an army of 4,000 Zulu warriors is advancing to the British position, Lieutenant John Chard (Stanley Baker) of the Royal Engineers assumes command of the small British detachment. Lieutenant Gonville Bromhead (Michael Caine), an infantry officer, is rather put out to find himself subordinate to an engineer due to the latter’s slightly earlier commission. Realising that they cannot outrun the Zulu army with wounded soldiers, Chard decides to make a stand at the station, using wagons, sacks of mealie, and crates of ship’s biscuit to form a defensive perimeter to counter the Zulu nation’s deadly effective Bull tactical enveloping formation. Witt becomes drunk and demoralises the men with his overtly dire predictions; the soldiers of the Natal Native Contingent desert. Chard orders Witt to be locked up in a supply room. As the Zulu impis approach, a contingent of Boer horsemen arrives. They advise Chard that defending the station is hopeless. They retreat in haste, despite Chard’s desperate pleas for them to stay. The Zulu army approach and then charge. The British open fire, but Adendorff informs them that the Zulus are only testing the British firepower. Witt again predicts the soldiers’ inevitable fate, before being driven from the battle with his daughter. Chard is concerned that the northern perimeter wall is undermanned and realises that the attack will come from all sides. The defenders are surprised when the Zulu warriors open fire on the station with rifles, taken from the British dead at Isandlwana. Throughout the day and night, wave after wave of Zulu attackers are repelled. The Zulus succeed in setting fire to the hospital, leading to intense fighting between British patients and Zulu warriors as the former try to escape the flames. Private Henry Hook (James Booth) takes charge and successfully leads the patients to safety. The next morning, the Zulus approach to within several hundred yards and begin singing a war chant; the British respond by singing “Men of Harlech“. In the final assault, just as it seems the Zulus will finally overwhelm the tired defenders, the British soldiers fall back to a small redoubt constructed out of mealie bags. With a reserve of soldiers hidden within the redoubt, they form into three ranks and seamlessly fire volley after volley, inflicting heavy casualties; the Zulus withdraw. After a pause of three hours, the defenders are still recovering when the Zulus re-form again on the Oscarberg. Resigned to another assault, the British are astonished when the Zulus instead sing a song to honour the bravery of the defenders before departing. The film ends with another narration by Richard Burton, listing the eleven defenders who received the Victoria Cross for the defence of Rorke’s Drift, the most awarded to a regiment in a single action up to that time. Ivor Emmanuel as Private Owen, a Welsh baritone and head of the company choir. At the end, Owen leads the men in singing “Men of Harlech“. A break in shooting on location with stars Michael Caine and Stanley Baker present. Cy Endfield was inspired to make the film after reading an article on the Battle of Rorke’s Drift by John Prebble. He took it to actor Stanley Baker with whom he had made several films and who was interested in moving into production. Endfield and Prebble drafted a script, which Baker then showed to Joseph E. Levine while making Sodom and Gomorrah(1962) in Italy. Levine agreed to fund the movie, which was produced by Baker’s company, Diamond Films. It was shot using the Super Technirama 70 cinematographic process, and distributed by Paramount Pictures in all countries excluding the United States, where it was distributed by Embassy Pictures. Most of Zulu was shot on location in South Africa. The mission depot at Rorke’s Drift was recreated beneath the natural Amphitheatre in the Drakensberg Mountains (considerably more precipitous than the real Rorke’s Drift, which is little more than two small hills). The set for the British field hospital and supply depot at Rorke’s Drift was created near the Tugela River with the Amphitheatre in the background. The real location of the battle was 100 kilometres (60 mi) to the northwest, on the Buffalo River near the isolated hill at Isandhlwana. Other scenes were filmed within the national parks of KwaZulu-Natal. Interiors and all the scenes starring James Booth were completed at Twickenham Film Studios in Middlesex, England. The majority of the Zulus were real Zulus. 240 Zulu extras were employed for the battle scenes, bused in from their tribal homes over 100 miles away. Around 1,000 additional tribesmen were filmed by the second unit in Zululand. The film was compared by Baker to a Western movie, with the traditional roles of the United States Cavalry and Native Americans taken by the British and the Zulus respectively. Director Endfield showed a Western to Zulu extras to demonstrate the concept of film acting and how he wanted the warriors to conduct themselves. It has been rumoured that due to the apartheid laws in South Africa, none of the Zulu extras could be paid for their performance and that, consequently, Endfield circumvented this restriction by leaving them all the animals, primarily cattle, used in the film. This allegation is incorrect, as all of the Zulu extras were paid in full – the main body of extras were paid the equivalent of nine shillings per day each, additional extras eight shillings, and the female dancers slightly less. Michael Caine, who at this early stage in his career was primarily playing bit parts, was originally up for the role of Private Henry Hook, which went to James Booth. According to Caine, he was extremely nervous during his screen test for the part of Bromhead, and director Cy Endfield told him that it was the worst screen test he had ever seen, but they were casting Caine in the part anyway because the production was leaving for South Africa shortly and they had not found anyone else for the role. Caine also believed that he was fortunate that the film was directed by an American (Endfield), because “no English director would’ve cast me as an officer, I promise you, not one,” due to his Cockney roots. Caine’s performance in Zulu won him praise from reviewers, and his next film role would be as the star of The Ipcress File in which he was reunited with Nigel Green. One technical problem the armorers and the director had to deal with concerned the rifles used during the filming. The company was unable to obtain enough Martini-Henry rifles to equip all of the extras, and had to fill in with No.1 Mark IV Enfields disguised with socket bayonets as used on the Martini-Henrys. In the scene at 1:37:30 where Chard orders a walking advance and volley fire by ranks, the cocking pieces can be seen moving forward as the men shoot, and one kneeling man can even be seen working the bolt on his rifle. Generally, in any scene shot from the soldiers’ left, the rifles being used are Enfields; in any scene shot from the right, Martini-Henrys. The budget of the film has been the subject of some speculation. Press related figures of $3 million and even $3.5 million were mentioned upon the picture’s American release. Joe Levine later revealed that Stanley Baker had approached him with a script and budget in 1962, just after the filming of Sodom and Gomorrah. Levine agreed to finance the picture up to $2 million. According to the records of the British completion bond company, Film Finance, Ltd., the production eventually finalized its budget at 666,554 GBP (approximately, $1,720,000) This included a contingency amount of 82,241 GBP, of which only 34,563 GBP had been used by the time the picture had all but wrapped post-production (Cost Report #15, 18 October, 1963). This would have placed the near-final negative cost at 618,876 GBP (approximately $1,600,000). The 24th Regiment of Foot is described as a Welsh regiment: however, although it was based in Brecon in South Wales, its designation was the ’24th (The 2nd Warwickshire) Regiment of Foot’. It did not become the South Wales Borderers until 1881. Of the soldiers present, 49 were English, 32 Welsh, 16 Irish and 22 others of indeterminate nationality. The song “Men of Harlech” features prominently as the regimental song; it did not become so until later. At the time of the battle, the regimental song was “The Warwickshire Lad“. There was no “battlefield singing contest” between the British and the Zulus. There are several inconsistencies with the historical record concerning the Swedish missionaries, the Witts. In the film, Witt is depicted as a middle-aged widower, a pacifist and drunkard, who has an adult daughter called Margareta. In reality, Otto Witt was aged 30 and had a wife, Elin, and two infant children. Witt’s family were 30 kilometres (19 mi) away at the time of the battle. On the morning of the battle, Otto Witt, with the chaplain, George Smith and Surgeon-Major James Henry Reynolds had ascended Shiyane, the large hill near the station, and noticed the approach of the Zulu force across the Buffalo River. Far from being a pacifist, Witt had co-operated closely with the army and negotiated a lease to put Rorke’s Drift at Lord Chelmsford’s disposal. Witt made it clear that he did not oppose British intervention against Cetshwayo. He had stayed at Rorke’s Drift because he wished “to take part in the defence of my own house and at the same time in the defence of an important place for the whole colony, yet my thoughts went to my wife and to my children, who were at a short distance from there, and did not know anything of what was going on”. He therefore left on horseback to join his family shortly before the battle. Lieutenants John Chard and Gonville Bromhead: Chard had received his commission in April 1868, making Bromhead the junior officer and second-in-command at the Drift even though he was an infantryman and Chard was an engineer. In the film, it is stated that Bromhead received his commission only three months after Chard when, in fact, it was a full three years after Chard. Surgeon Reynolds: During the Battle of Rorke’s Drift, Reynolds went around the barricades, distributing ammunition and tending to the wounded there, something that is not shown in the film. During the closing voiceover, he is also incorrectly referred to as “Surgeon-Major, Army Hospital Corps”; Reynolds was of the Army Medical Department, and was not promoted to the rank of Surgeon-Major until after the action at Rorke’s Drift. The pacifism apparent in Magee’s portrayal is also somewhat anachronistic and not based on the historical Surgeon Reynolds. Private Henry Hook VC is depicted as a rogue with a penchant for alcohol; in fact he was a model soldier who later became a sergeant; he was also a teetotaller. While the film has him in the hospital “malingering, under arrest”, he had actually been assigned there specifically to guard the building. The filmmakers felt that the story needed an anti-hero who redeems himself in the course of events, but the film’s presentation of Hook caused his daughter to walk out of the film premiere in disgust. Conversely, Corporal William Allen is depicted as a model soldier; in real life he had recently been demoted from sergeant for drunkenness. Colour Sergeant Frank Bourne (1854–1945) is depicted as a big, hardened, middle-aged veteran; in fact, he was of modest stature and, aged 24, the youngest colour sergeant in the British Army. He was called “The Kid” by his men. Colour Sergeant Bourne would not have worn medals on his duty uniform. Moreover, Green’s costume has the chevrons on the wrong arm. After the battle Bourne was offered a commission but turned it down because he lacked the money necessary to serve as a commissioned officer; he did accept a commission in 1890. He was the last British survivor of the Battle and died as a full colonel. The role of Padre George Smith (“Ammunition” Smith) is completely ignored. Corporal Christian Ferdinand Schiess was only 22, significantly younger than the actor who portrayed him. The detachment of cavalry from “Durnford’s Horse” who ride up to the mission station were members of the Natal Native Contingent, mainly composed of black riders rather than the local white farmers depicted in the film, who had survived the Battle of Isandlwana and had ridden to Rorke’s Drift to warn and aid the garrison there. They were present during the opening action with the Zulus, but then rode off as they had very little ammunition for their cavalry carbines. Captain Stephenson is depicted at their head; in reality he was leading the NNC infantry, who had already deserted. The uniforms of the Natal Native Contingent are inaccurate: NNC troops were not issued with European-style clothes. Only their European officers wore makeshift uniforms. The rank and file wore traditional tribal garb topped by a red rag worn around the forehead (as correctly depicted in the prequel Zulu Dawn). The story of their desertion is true. However, as Witt had already left, he was not responsible for their departure. They left of their own accord, with Captain Stephenson and his European NCOs. These deserters were fired at as they left and one of their NCOs, Corporal Anderson, was killed. Stephenson was later convicted of desertion at a court-martial and dismissed from the army. The attack on the mission station was not ordered by King Cetshwayo, as the audience is led to believe in the film. Cetshwayo had specifically told his warriors not to invade Natal, the British Colony. The attack was led by Prince Dabulamanzi kaMpande, the King’s half-brother, who pursued fleeing survivors at Isandlwana across the river and then moved on to attack Rorke’s Drift. Although almost 20,000 rounds of ammunition were fired by the defenders, just under 400 Zulus were killed at Rorke’s Drift. A similar number were left behind when the Zulus retreated, being too badly wounded to move. Comments from veterans many years after the event suggest the British killed many of these wounded men in the battle’s aftermath, raising the total number of Zulu deaths to over 700. The ending of the film is somewhat fictitious. There was no Zulu attack at dawn on 23 January 1879, which in the film led to the singing of “Men of Harlech”. There was only sparse fighting with a few remaining Zulus. However at roughly 7:00 am, an Impi suddenly appeared, and the British manned their positions again. No attack materialised, as the Zulus had been on the move for six days prior to the battle. In their ranks were hundreds of wounded, and they were several days’ march from any supplies. Around 8:00 am, another force appeared, the defenders abandoned their breakfast and manned their positions again. The approaching troops were the vanguard of Lord Chelmsford’s relief column. The Zulus did not sing a song saluting fellow warriors, and they did not depart peacefully. They departed at the approach of the British relief column. This inaccuracy has been praised for showing the Zulus in a positive light and for treating them and the British as equals, but it has also been criticized as undermining any anti-imperial message of the film by unhistorically showing the Zulu warriors legitimizing the presence of the British soldiers by saluting them as “fellow braves”, and for portraying the battle as a fair fight despite the superior British firearms. On its initial release in 1964, it was one of the biggest box-office hits of all time in the British market. For the next 12 years it remained in constant cinema circulation before making its first appearance on television. It then went on to become a television perennial, and remains beloved by the British public. Rotten Tomatoes gives a score of 95% based on reviews from 21 critics. Among more modern assessments, Robin Clifford of Reeling Reviews gave the film four out of five stars, while Brazilian reviewer Pablo Villaça of Cinema em Cena (Cinema Scene) gave the film three stars out of five. Dennis Schwartz of Ozus Movie Reviews praised Caine’s performance, calling it “one of his most splendid hours on film” and graded the film ‘A’. Although actual participants of the battle are named characters in the film, they bear little resemblance to historical accuracy. The most controversial portrayal is the one of Private Hook who is depicted as a thief and malingerer (the real Hook was a model soldier and teetotaller). His elderly daughters were so disgusted with the Zulu character, they walked out of the London premiere in 1964. The fictional depiction has led to an ongoing campaign to have the historical reputation restored to the real Private Hook. The film’s producers admitted they chose Hook simply because “they wanted an anti-hero who would come good under pressure”. By 2007 critics were divided over whether the movie should be seen as deeply anti-imperialist or as racist. Zulu was filmed in Technirama and intended for presentation in Super Technirama 70, as shown on the prints. In the UK however, the only 70mm screening was a press show prior to release. While the vast majority of cinemas would have played the film in 35mm anyway, the Plaza’s West End screenings were of the 35mm anamorphic version as well rather than, as might have been expected, a 70mm print. This was due to the UK’s film quota regulations, which demanded that cinemas showed 30% British films during the calendar year, but the regulations only applied to 35mm presentations. By 1964 the number of British films available to a cinema like the Plaza could be limited and Zulu gave them several weeks of British quota qualification if played in 35mm. In other countries the public did get to see the film in 70mm. Ernest Archer was nominated for a BAFTA Award for Best Colour Art Direction on the film. 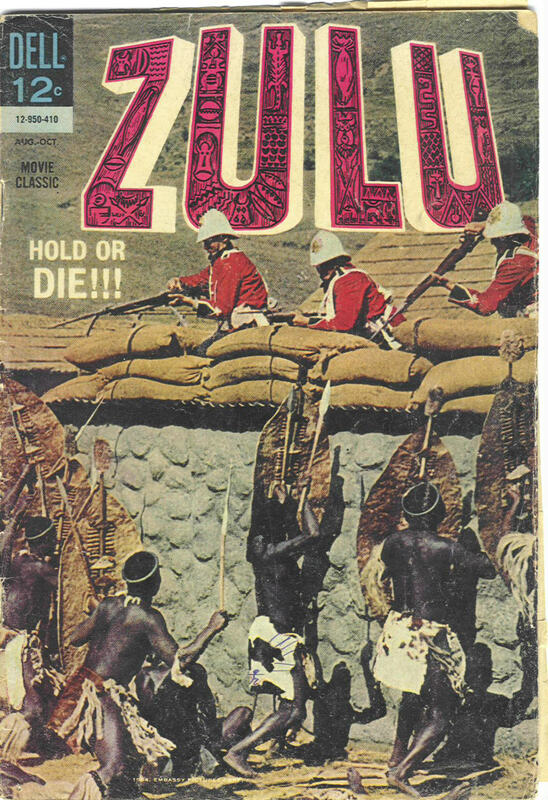 The magazine Total Film (2004) ranked Zulu the 37th greatest British movie of all time, and it was ranked eighth in the British television programme The 100 Greatest War Films. Empire magazine ranked Zulu 351st on their list of the 500 greatest films. In the US, Zulu lapsed into the public domain from 1991 until 2000, so that there were several releases of the film on home video/Laserdisc/DVD in North America – most notably a LaserDisc release by The Criterion Collection which retains the original stereophonic soundtrack taken from a 70mm print. An official DVD release (with a mono soundtrack as the original stereo tracks were not available) was later issued by StudioCanal through Metro-Goldwyn-Mayer. The film was released on Blu-ray in the UK in 2008; this version is region-free. On 22 January 2014, Twilight Time issued a limited-edition Blu-ray of Zulu in the US with John Barry’s score as an isolated track; the release date being the 50th anniversary of the film and the 135th anniversary of the actual battle. A soundtrack album by John Barry featuring one side of the film score music and one side of “Zulu Stamp” was released on Ember Records in the UK and United Artists Records outside the Commonwealth. The choreographer Lionel Blair arranged a dance called the “Zulu Stamp” for Barry’s instrumentals. A computer game entitled Zulu Wars was released on home formats during the 1980s. A comic book by Dell Comics was released to coincide with the film that features scenes and stills not in the completed film. Conte toy soldiers and playsets decorated with artwork and stills from the film were produced. The Battle of Helm’s Deep sequence in Peter Jackson‘s The Lord of the Rings: The Two Towers was filmed in a manner deliberately reminiscent of Zulu, according to Jackson’s comments in supplemental material included in the special extended DVD edition of The Two Towers. The Germanic war chant in the battle scene at the beginning of Ridley Scott‘s film Gladiator is the Zulu war chant from Zulu. In the video commentary, Scott said that Zulu is one of his favourite films. The Battle of O’Rourke’s Ford in S. M. Stirling‘s science fiction novel On the Oceans of Eternity is a recreation of the movie premise, right down to a malingering Private Hook. Stanley Baker purchased John Chard’s Victoria Cross in 1972 believing it to be a replica. After Baker’s death, it was sold to a collector at a low price but then found to be the genuine medal. Marking the anniversary of the Battle of Rorke’s Drift, the popular BBC TV prime time programme The One Show featured the film. The One Show said the film was still popular in British culture. It also showed behind the scenes footage of the filming and cast members. The broadcast date of this episode is unknown. In many interviews, Afrika Bambaataa has said that he chose the name “Zulu” based on inspiration from the 1964 film of the same name. What Afrika Bambaataa “saw in Zulu, were powerful images of Black solidarity.” This would later inspire the name for his organisation, Universal Zulu Nation, in the 1970s. Music also by John Barry and inspired by his earlier theme to Zulu was used in the 1995 James Earl Jones and Richard Harris film; Cry, The Beloved Country. Jump up^ “Zulu (1963)”. British Film Institute. Retrieved 28 July 2014. Jump up^ “Film giants step into finance”. The Observer. London, UK. 19 April 1964. p. 8. ^ Jump up to:a b c d e f g Stafford, Jeff. “Zulu”. Turner Classic Movies. Jump up^ “Michael Caine”. Front Row (radio). 29 September 2010. BBC Radio 4. Retrieved 18 January 2014. Jump up^ Hall, Sheldon (2005). Zulu: With Some Guts Behind It: The Making of the Epic Movie. Sheffield, England: Tomahawk. p. 68. ISBN 978-0-95319-2-663. Jump up^ Thompson, Howard (1 September 1963). “Stanley Baker: Peripatetic Actor-Producer; Genesis Provincial Debut”. The New York Times. New York City. p. X5. (Subscription required (help)). ^ Jump up to:a b c Hall, Sheldon (19 January 2014). “The untold story of the film Zulu starring Michael Caine, 50 years on”. The Independent. Retrieved 10 June 2014. Jump up^ Hawksley, Rupert (22 January 2014). “Zulu: 10 things you didn’t know about the film”. The Daily Telegraph. Retrieved 10 June 2014. Jump up^ Stahl, Lesley (20 December 2015). “Michael Caine”. 60 Minutes (television interview). Retrieved 29 April 2016. Jump up^ Newsinger, John (July 2006). The Blood Never Dried: A People’s History of the British Empire. Bookmarks Publications Ltd.
Jump up^ “Fact Sheet No. B3: The 24th Regiment and its local links”. Museums of the Royal Regiment of Wales. Archived from the originalon 23 November 2008. Jump up^ “Zulu”. Rorkes Drift VC. Retrieved 12 May 2016. Jump up^ Chadwick, G. A. (January 1979). “The Anglo-Zulu War of 1879: Isandlwana and Rorke’s Drift”. Military History Journal. The South African Military History Society/Die Suid-Afrikaanse Krygshistoriese Vereniging. 4 (4). Retrieved 12 May 2016. ^ Jump up to:a b “Popular Myths”. Rorkes Drift VC. Retrieved 12 May 2016. Jump up^ Hale, Frederick (December 1996). “The Defeat of History in the film Zulu”. Military History Journal. The South African Military History Society/Die Suid-Afrikaanse Krygshistoriese Vereniging. 10 (4). Retrieved 12 May 2016. ^ Jump up to:a b “James Henry Reynolds”. Rorkes Drift VC. Retrieved 12 May2016. ^ Jump up to:a b “Rorke’s Drift 125-year anniversary”. BBC News. 24 January 2004. Retrieved 12 May 2016. ^ Jump up to:a b Roberts, Laura (15 August 2008). “The battle to rehabilitate Zulu’s Henry Hook after film portrayed him as drunken malingerer”. Daily Mail. Retrieved 12 May 2016. Jump up^ “Colour Sergeant Bourne DCM”. Rorkes Drift VC. Retrieved 12 May2016. Jump up^ “An account by Lieutenant-Colonel Frank Bourne, OBE, DCM”. The Listener. 30 December 1936. Retrieved 12 May 2016 – via Rorkes Drift VC. Jump up^ “George Smith”. Rorkes Drift VC. Retrieved 12 May 2016. Jump up^ “Cpl. Ferdnand Christian Schiess”. Rorkes Drift VC. Retrieved 12 May 2016. Jump up^ Smythe, Graeme. “The Battle of Rorke’s Drift, 22/23 January 1879”. Isibindi Africa. Archived from the original on 20 September 2010. ^ Jump up to:a b Dovey, Lindiwe (2009). African Film and Literature: Adapting Violence to the Screen. Columbia University Press. pp. 37–38. ISBN 9780231519380. Retrieved 5 January 2018. While interpretations of the film have been polarized between critics who claim that it is deeply anti-imperial and those who believe that it is racist (Hamilton and Modizane 2007), I want to briefly analyse the final sequence of the film to show that in treating the Zulus “equally” the filmmakers compromise an anti-imperial message of the film. … the Zulu warriors have come back “to salute fellow braves”. … This final scene, however, is not historically accurate. … The war was not fought on equal terms, due to the superior firearms of the British, and the filmmakers therefore requirethe Zulus to pay tribute to the British since it is only the Zulus who can authenticate the fairness of the war. Jump up^ Crowther, Bosley (July 8, 1964). “It’s British vs. Natives in Action-Filled ‘Zulu‘“. The New York Times: 38. Jump up^ “Zulu”. Variety: 6. January 29, 1964. Jump up^ Coe, Richard L. (July 24, 1964). “10,000 Zulus Bite the Dust”. The Washington Post: B9. Jump up^ Balliett, Whitney (July 18, 1964). “The Current Cinema”. The New Yorker: 93. Jump up^ “Zulu”. The Monthly Film Bulletin. 31 (361): 23. February 1964. Jump up^ “Zulu”. Rotten Tomatoes. Retrieved 16 September 2018. Jump up^ “Zulu Reviews”. Rotten Tomatoes. Retrieved September 16, 2018. Jump up^ Schwartz, Dennis (May 20, 1999). “Zulu”. Ozus’ Movie Reviews. Retrieved September 16, 2018. Jump up^ Swaine, Jon (15 August 2008). “Battle to restore ‘Zulu’ hero Henry Hook’s reputation”. The Daily Telegraph. Jump up^ “Busting the myths of Rorke’s Drift”. readinggivesmewings.com. 2 December 2011. Retrieved 28 January 2016. Jump up^ Kimon de Greef (2 June 2014). “The film Zulu, 50 years on: classic or racist?”. This Is Africa. Retrieved 5 January 2018. TIA(This is Africa): And did you get to watch it when it was finished? MB(Mangosuthu Buthelezi): Censorship was terrible in South Africa, and the film, which showed white and black people fighting and killing each other, was banned for black audiences. The government had this silly attitude that the scenes of blacks killing whites would incite people to violence. But we requested permission for the Zulu extras who participated to see the film, and so a few special screenings were organised in Durban and some smaller KwaZulu towns. Jump up^ “100 Greatest War Films : 10 to 6”. Film4. Archived from the original on 27 March 2009. Retrieved 12 May 2016. Jump up^ Lipp, Chaz (5 February 2014). “Blu-ray Review: Zulu – Twilight Time Limited Edition”. The Morton Report. Retrieved 29 July 2014. Jump up^ Hall, Sheldon (2005). Zulu: With Some Guts Behind It: The Making of the Epic Movie. Sheffield, England: Tomahawk. ISBN 978-0-95319-2-663. Jump up^ “Magazine cover”. Jamesbooth.org. Retrieved 6 June 2014. Jump up^ “Conte Collectibles – The Worlds Finest Toy Soldiers”. Contecostore.com. Retrieved 6 June 2014. Jump up^ “The mystery of Sir Stanley and a ‘fake’ VC medal”. Wales Online. 5 April 2010. Retrieved 17 November 2016. Jump up^ Chang, Jeff (2005). Can’t Stop Won’t Stop: A History of the Hip-Hop Generation (Reprint ed.). New York: Picador. pp. 89–108. ISBN 978-0312425791. Dutton, Roy (2010). Forgotten Heroes: Zulu & Basuto Wars including Complete Medal Roll. Infodial. ISBN 978-0-95565-544-9. Hall, Sheldon (2005). Zulu: With Some Guts Behind It: The Making of the Epic Movie. Sheffield, England: Tomahawk. ISBN 978-0-95319-2-663. Morris, Donald R. (1998). The Washing of the Spears: The Rise and Fall of the Zulu Nation (2nd ed.). Da Capo Press. ISBN 978-0-30680-8-661.